The Low Down: All the students at The Gallagher Academy are returning after Winter Break. Though Cammie was debriefed in DC regarding Josh, her ex-boyfriend, her mother seems preoccupied on their trip back to Virginia. Cammie promises her mother that she will be “normal” (well, as much as a spy-in-training can be). But what’s up with the East Wing being in complete lockdown? And what did Cammie’s mom mean when she was overheard saying “No, Cammie doesn’t know anything?” And where does a black thorn fit into the picture? Cammie’s promise to stay on the straight and narrow with regard to extra-curricular spying is more difficult to keep than she thought, especially when she and her friends suspect the school of lying about what really happened in the East Wing. Then they discover the identity of “Blackthorne.” And when Cammie thinks of Josh, it still hurts. What will happen if Cammie runs into Josh? How will the girls deal with the Blackthorne situation? And when the school’s security is breached, can Cammie throw herself into the fray and lead the students to recover the stolen information? Best Thang ‘Bout It: This is an awesome series. It’s one of those where you do the ol’ face-palm and wonder why someone hadn’t written books about girls training to be spies long before. I guess maybe it was because the universe was waiting for Ms. Carter to shepherd it through with her more than capable pen (laptop?). The books have a lot of heart, humor and thrills and even some romance. There is a balance that the girls need to keep, between learning the spy game and just being girls. It is not always easy, or clear. I’m Cranky Because: Josh is sad. Should You? : If you took one of those mirrors on a stick that you run under a car to see if any prisoners are escaping, you would only see a big sign that says YES. 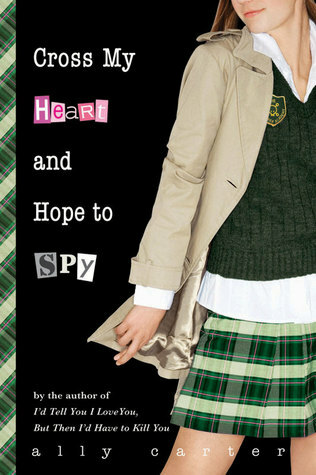 Cross My Heart and Hope to Spy by Ally Carter was published on October 2, 2007 by Hyperion Book CH. Also check out my reviews of other works by Ally Carter: I’d Tell You I Love You, But Then I’d Have to Kill You (The Gallagher Girls #1) and Out of Sight, Out of Time (The Gallagher Girls #5). Previous PostHaunted Week is Coming!Next PostStacking the Shelves: What’s New This Week? That’s the next one I need to read. I have read 1, 2 & 5. Don’t ask.